Commentary, questions and challenges to the received wisdom about the Earth, its systems, its history, and its uses. There’s a single-minded fascination with glaciers. A sort of atavistic, prickling-behind-the-neck connection people seem to have with the ice ages. In Europeans, it seems to be more a vestigial connection – a sort of cultural memory. Perhaps it’s why the western populace is so consumed with the idea of global warming and the loss of polar ice – it is rather like the last remnant of the ice age, which was the back yard of European pre-history. Whenever someone asks me a geology question – this typically only happens when we are on a weekend camping trip or something similar – they almost invariably interrupt my explanation at some opportune point and ask if what I am telling them is related to “the glaciers”. In most cases what we are discussing is not even remotely associated with glaciation. I understand the connection. The first nip of real autumn in the air stirs something in some little cro-magnon recess of our northern cultural memories and there is a connection to our ancestors. I think it is one of the reasons most of the global warming alarmists live in high latitude areas – you don’t hear many people from the tropics screaming about the loss of polar ice – except to get money from some global warming based scheme (I’ll explore the Maldives a little below). Eur-Asians are evolved varieties of the human species with a circadian link to a seasonal way of life. It is the rare person who chucks northern life with all its harshness and wild temperature and precipitation swings, to move to more moderate climate in a lower latitude. Retirees don’t count – these are people whose testosterone and estrogen productions have waned which seems to make them more reasonable specimens of our ilk and suppresses the relentless, mindless drive that keeps the rest of us soldiering on in the face of the harshest of conditions for at least half of each of our few years on Earth. If it sounds like rubbish to you, ask yourself why any Swede, or German, or Norwegian, or Scotsman, or Canadian (all countries with very strong ‘stop global warming’ activists and organizations) or Minnesotan, wouldn’t jump up and down, wave a banner an d shoot off fireworks of celebration if future winters were to be a bit less severe, a bit shorter and the growing season consequently extended just a few extra days. (Minnesota farmers were sold a variety of corn for the increased, global warming induced longer growing season – result? Crop FAILURES!!) After all, those WERE the condition a thousand years ago, during the Medieval Climate Optimum. There were thriving agricultural communities in all those countries – even in Greenland where an active viticultural concern was thriving – despite the absence of modern farming and chemicals. Now those countries all have severe winters with comparatively shortened growing seasons (Greenland has NO growing season now). But tell them that things might warm up a bit and they let out a collective yelp of fear and alarm you can hear at land’s end. I can think of no better reason than we northerners are clinging to some sort of suppressed, ice-age cultural remnant, and we retain a sort of perverse fascination with freezing. 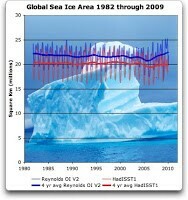 Of course what those global warming activisits are being told is that the hypothetical increase of temperature over the next century (not a sure thing by any account – well except the account of the U.N. IPCC) will result in a rise of sea level of a meter or two, which would submerge many populated areas. Is that true? Well, the only thing we can do is to look at the evidence to see if that is what happened the last time the Earth was warm. What was sea level during the Medieval Climate Optimum? Or the Roman Warm Period? Pretty much what it is now, really. Where were the deserts then? Pretty much where they are now. And so on. Now this sea level rise thing is really interesting. Places like the Maldives are claiming that the sea level rise caused by anthropogenic global warming (AGW) is drowning their archipelago. It is true that sea level has been rising – pretty much since the end of the last glacial maximum (14,000 years ago), since which time it has risen about 130 meters (that’s about 400 feet). Recent measurements show a definite slow down in the rate of the rise, however. Now there are two causes of island submergence – sea level can actually rise – or the island(s) could be sinking, which is a very common thing among oceanic islands. 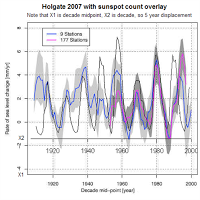 One thing is certain – there is NO evidence that sea level rise was/is caused by AGW – especially because atmospheric temperatures have decreased slightly in recent years and sea surface temperatures have not increased. Moreover, there are now MANY published papers regarding the supposed loss of polar ice, which has actually increased in extent and has been increasing in thickness and mass for the past few decades. Anyway, in the absence of some sort of cultural memory of our pre-historic, ice-age human ancestors, I am at a loss to explain the fear people have that the Earth might be coming out of one of the coldest periods in its history and becoming more like it has been for most of its history; i.e., warmer than it has been these past several million years. Based on the science – the real science – it doesn’t look as though we should expect any change very soon, however. Personally, I love winter and I admit to the lure of the Pleistocene (see my thread on the Holocene, below) – the sight of musk oxen, or wolverines, American bison, caribou and other arctic to sub-artic megafauna stirs some sort of deep rumblings of the Pleistocene in us. Gotta go now, I feel the urge to embed some sharpened sticks facing upward at the base of a cliff. Well, perhaps I’ll just settle for a glass of scotch. Of course, I’ll Take Mine on the Rocks, Please. August 5, 2015 in Climate, Geology, Humourous. The Petroleum Age has Just Begun! Tom G(ologist) on Concentrate, Please!